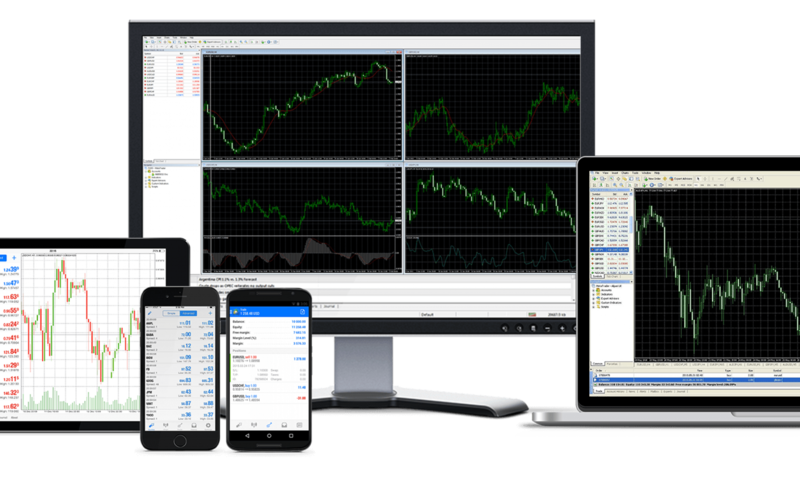 MetaTrader 4 (MT4) is one of the most popular forex trading platforms among traders and financial institutions. In 2005, the software company Metaquotes Software Corp., introduced the first enhanced version of the platform, intended mainly for forex trading. Now, MT4 is licensed to many forex brokers that offer online forex and CFDs trading to their customers. Clients terminal provides live streaming quotes of financial instruments, charts and the ability to place market and pending orders. Using MT 4, customers also can analyze financial markets, run so-called expert advisors or copy orders of other traders. The platform has a built-in editor and compiler and provides free access to user-created libraries and help. Metaquotes Software has developed its own programming language for compiling expert advisors and custom technical indicators – MQL4 and MQL5. MetaTrader 4 supports two market execution modes (Instant and Market execution), four pending orders, two stop orders including a trailing stop. There is a quick trading option that allows placing orders from the chart directly (1-click trading). The platform is equipped with various analysis-tools. There are 9 time-frames (from 1 minute to 1 month) for every instrument, 30 built-in indicators, more than 2,000 free custom indicators and 700 paid ones. A unique feature is the ability to analyze the chart of the same financial instrument at different time-frames. That allows to weigh the current market movements and build long-term and short-term trading strategies. MT4 provides 24 graphic objects such as lines, channels, Fibonacci tools, arrows and shapes. They can be attached to both charts and indicator areas. Objects of one-time frame are also available in others, helping to assess the impact of different time trends. The platform allows unlimited number of real time charts to be opened at the same time and different graphic objects and indicators to be attached to them. Financial news tool is also available in MT4 platform. It certainly helps traders get a glimpse into the financial and geopolitical situation that would affect the movement of financial instruments. MetaTrader 4 allows customers to create alerts for certain trading conditions – when the market price goes beyond the predefined values. The result is an audible alarm, sending an email or SMS. Fans of automated trading with expert advisors can rent virtual hosting directly from MT4. This is the optimal way for ensuring continuous work of trading robots, the software company claims. Virtual hosting has been specifically designed for MetaTrader platforms and offers an easy way to transfer expert advisors, indicators and scripts. MT4 is also available as a web-based version. It allows customers to trade from any browser and operating system without any installation. Their account is accessible from any computer connected to the Internet. There are MetaTrader 4 mobile applications for iOS and Android devices. Functionality of the mobile versions is similar to the desktop version but they also provide some additional features such as chat among traders and push notifications.